Please refer to our stock # MMC15 when inquiring. 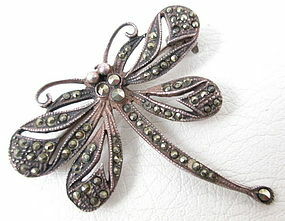 This lovely vintage pin measures 1 5/8" long x 1 5/8" wide and is handcrafted from sterling silver. The front is intricately set with faceted marcasites and the reverse has a secure safety closure. It is in very good condition and is hallmarked "925" on the reverse.